You seem to have such a child's eyes and wonder when you look at any circumstance and perspective. I wish we were all as open to experience new things so openly and honestly as you've been able to. Don't grow up Peter. Great post. 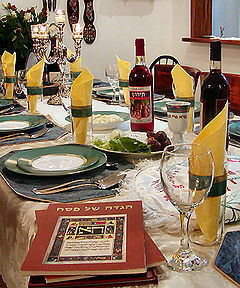 There's much to commend Passover, and it's considered a mitzvah - a blessing - to welcome a stranger to the family seder. Adrienne's is clearly a family full of menschlichkeit (you'll have to ask her).